The EasyOne Pro® is both patient-friendly and easy to maintain. Simply switch on the device and begin testing immediately. Medical professionals can perform annual maintenance themselves in only 10 minutes. Extremely robust and accurate flow results are delivered without the need for calibration thanks to our TrueFlow™ technology. Spend more time on patient care. TrueCheck™ ensures that each DLCO trial is accurate and validated without calibration and warm-up time. Weighing only 18 lbs. (9kg), the EasyOne Pro® is compact & durable – without compromising quality. It easily fits in any office setting. "My clinical research on asthma and COPD happens at the point of care in some of the most remote, resource limited places in the world. Because of this, I need highly portable, very durable diagnostic devices reporting consistent and accurate results even under the toughest conditions. I use ndd’s devices because I know no matter the condition, the device will report accurate results." "Our academic activities related to trainings and continuous learning for the specialists that take care of the respiratory health in our region, are supported by new technologies. Our experience with ndd devices has been very positive because they adapt to our necessities, they are always updated regarding new standardization and technological advances." Medical Director of the San Antonio Pulmonary Fibrosis Support Group and Director of the University of Texas Health Science Center at San Antonio Center for Interstitial Lung Disease. Get maximum efficiency and patient comfort in any setting. TrueFlow™ and TrueCheck™ ensure optimal results, independent of the clinician. With our integrated commenter you can easily define standard comments and quickly add them to your patient's results. Watch our video guide for more details. Get automatic quality grading and interpretation based on NLHEP and ATS/ERS with the EasyOne Pro®. With our simple but smart pediatric incentives children quickly understand what to do. This shortens your testing time and helps you achieve good quality spirometry results – and the children have fun doing the test. Customize available standard provocation protocols for your needs or create your own. You can easily install the customized provocation protocol on your ndd devices. Customize reports and chose the parameters to be displayed. TrueCheck™ takes care of the essential quality control for gas analysis testing. EasyOne Pro® is the only device proven to be accurate for a lifetime for DLCO measurements. To review case studies and additional information about our proven technology, please click here. Stop worrying about calibration or accuracy of flow measurements. TrueFlow™ is the only ultrasound technology proven to be accurate for a lifetime for flow and volume measurements. The first in line for newly published predicted values: EasyOne® devices are used in predicted studies worldwide (e.g. LUNOKID, ALAT). Please see our specification below for a complete list of the supported predicted values. Avoid cross-contamination and reduce cleaning to an absolute minimum with the combination of spirette and barriette. Transmit and share data among ndd devices or to your Electronic Medical Record system. Stay connected and easily share data or print reports. EasyOne Pro® is equipped with a modern embedded PC solution that makes network and printer connections extremely easy and stable. Protect your patient information. EasyOne Pro® is a modern system designed to fulfill your cyber security needs. Go beyond normal lung function testing and get access to all raw data of any test collected. The tool WBreath is used in special study setups, but also by our support team. Stay compliant with ATS/ERS standards and specific country regulations. What is the difference between the EasyOne Pro and Pro LAB? The EasyOne Pro LAB is exactly the same as the EasyOne Pro, except that it has the capability to perform the multi-breath washout (MBW) test. This test requires additional sensors and the use of 100% Oxygen. Which predicted or normal values are supported? You can find the product specification on the respective product pages. The specification contains a list of all supported normal values. To get more detailed information about the supported parameters, age range, ethnicities and height range of each supported predicted set, please click here. What is BTPS and how is it used? BTPS Correction is used to convert flow and volume measured at ambient conditions to the conditions within the lungs. Ambient conditions are called ATP (ambient temperature, pressure); the conditions within the lungs are called BTPS (body temperature, pressure, water vapor saturated). Can the EasyOne Pro/LAB be connected to my network for backup and data sharing? Yes. Connecting the device to your network allows several additional benefits. Do I need any special calibration equipment for the EasyOne Pro/LAB? All EasyOne products are designed to require no calibration and minimal maintenance. The device is designed to remain in calibration throughout its lifetime. No calibration procedures are required prior to testing. Our TrueFlow ultrasonic technology assures accurate volume and flow measurements every time. And our unique automated TrueCheck process assures that all gas measurements are accurate for each test. You may choose to use the optional 3-liter calibration syringe to verify volume and flow accuracy, as recommended by ATS/ERS. Can I connect the EasyOne Pro/LAB to my EMR? Yes. ndd’s products are all completely HL7 compatible enabling connectivity to virtually all EMRs. We would be happy to work with you to configure an interface for your particular EMR system. We are also constantly working to expand our library of dedicated integrations. For more information on connectivity with your particular EMR contact our Technical Support team. How long does it take to test a patient with the EasyOne Pro/LAB? A PFT session including spirometry and DLCO generally takes less than 20 minutes. What are my options for printing results from the EasyOne Pro/LAB? The EasyOne Pro/LAB is compatible with virtually all PC-style USB printers, without the need for external driver installation. The printer can be connected directly to a USB port on the rear of the device. We can sell you a printer with the device, or you can supply your own. You can also connect the device to your network where it will automatically find any connected, compatible printers avoiding the need for a dedicated printer for your PFTs. What consumables are required for the EasyOne Pro/LAB? Spirette: Each test performed requires the use of a spirette. This is a single-patient-use mouthpiece which ensures that no contamination can reach the internal flow path of the device. This means that no cleaning is required between patients, and no calibration, ever. Simply toss the spirette after each test session. Barriette: For a DLCO test, in addition to the spirette, you will need to use a barriette. This protects the valve and hose system from contamination, eliminating the need for cleaning between patients. FRC barriette: This is similar to the DLCO barriette, but used only when performing a multi-breath washout test. Gasses: The DLCO test requires a standard medical grade DLCO gas mixture consisting of 0.3% Carbon Monoxide, 10% Helium, 21% Oxygen, remainder Nitrogen. 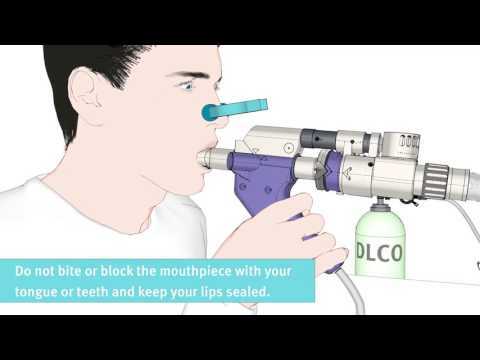 The multi-breath washout test requires 100% Oxygen. These gasses are readily available from your local medical gas supplier in various tank sizes. We will assist you in selecting the appropriate tank regulators required for connection to the device. How much space will an EasyOne Pro/LAB require in my office? The device itself is self-contained and measures only 270 x 335 x 270 mm (10.6 x 13.2 x 10.6 inches) (h x w x d). No additional PC, monitor, keyboard or control unit is required. This allows it to easily fit on a counter. You will also need to allow for storage of the gas tank(s) which come in a variety of sizes, and can usually fit comfortably in a corner, or under the counter. How do I backup my patient data? Data can safely be exported by using the “Export Data” feature or “Backup” feature within the Storage tab in the configuration.